Running a business is all about building relationships. While it’s possible to survive for a time by making enough sales to unique customers, it’s not a sustainable business practice in the long-term. To build a strong and growing organisation, merchants need to keep their churn rate low and keep their customers coming back for more. Customer churn refers to when a customer ceases their relationship with a company. The term comes from the analogy that the company’s client base is churning or being agitated as individual customers leave and enter. In other words, the higher your churn rate, the more customers you are losing. It’s hard enough to stand out in a crowded market and to increase your conversion rate, so once you’ve made a new customer you shouldn’t let them go without a fight. Even if your total number of customers remains constant, reducing customer churn is still a key business goal since it costs more to onboard a new customer than to keep an existing one. Begin taking steps to reduce customer churn now and start building a long-term loyal client base. US pay-TV providers are facing high churn rates because of new competition from digital streaming services. One of the leading causes of customer churn for smartphone providers is software-related issues or malfunctions in the device. DDoS (distributed denial of service) attacks are a major cause of churn for online service providers. 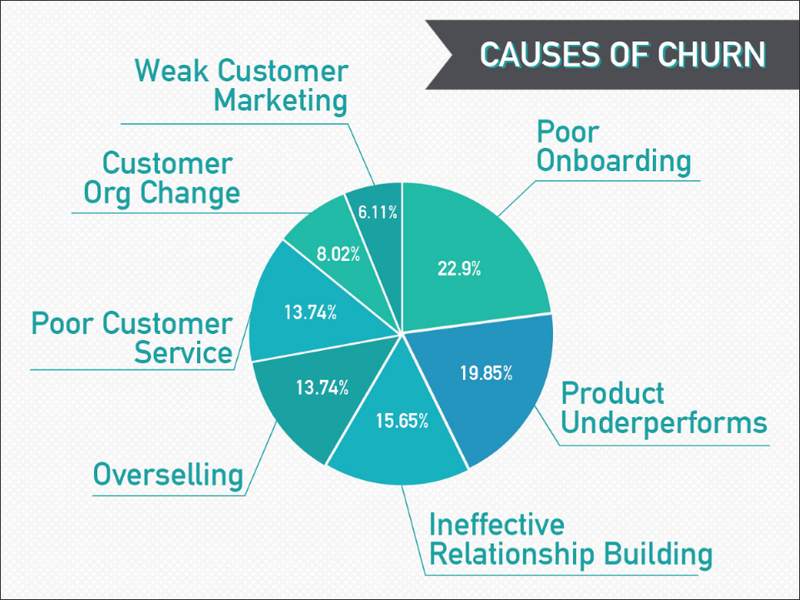 There are many possible causes of customer churn and not all of them are within your control. For example, many organisations differentiate between voluntary and involuntary churn, since there’s little you can do about a customer who ceases their relationship with your business through no fault of your own. However, in the case of voluntary churn it’s up to you to reduce the churn rate as best as you can by eliminating the causes of churn that you can control and putting safeguards in place to protect you and your customers from those that you can’t. The top cause of customer churn is poor onboarding. The first experience your customer has with your product sets the tone for your relationship. If their onboarding is confusing and overwhelming and the time to first value is too long, your ability to maintain their business and build loyalty will be severely compromised. Take steps to reduce friction such as creating walk-through guides and how-to videos. Test your onboarding process by monitoring user behaviour, identifying causes of friction and abandonment, and measuring the impact of the adjustments you make. You should also consider making your onboarding process mandatory, even if that suggestion seems contrary to the goal of reducing friction. If you let consumers use your services without fully onboarding, you make it easy for them to churn. While mandatory onboarding might lower your conversion rate, it could benefit you in the long-term by lowering your churn rate as well and helping you build a more valuable client base. If your onboarding is flawless but your churn rate remains high, it could indicate that your product is underperforming. E-commerce is a competitive industry and you need to offer a unique value proposition to win over a customer’s loyalty. Identify your niche and follow proven KYC practices to ensure that your target audience is uniquely benefitting from your product in ways that your competitors can’t match. Also, don’t ship an unfinished product. In order to meet deadlines and see profits sooner rather than later, many companies make the mistake of shipping a product before it’s been fully tested and the bugs and errors have been identified and fixed. In e-commerce, this practice is common in part because of how easy it is to remotely patch your software post-release. While this allows you to get your product to market more quickly and provides you with free testing in the form of the first few unsuspecting and unfortunate buyers of your product, the likelihood is high that those customers will churn because of the poor quality of your product and will propagate that negative reputation even after your product has been patched. How you measure your customer churn rate depends on the nature of your business. Many membership or subscription-based businesses consider a customer churned when they cancel their membership. However, cancellation is just the final step of a client ending their relationship with your business. If you can predict when your customers are going to churn, you can take steps to prevent it. For non-subscription businesses, a common method for calculating the churn rate is to identify how frequently your customers interact with you. For example, if your customers are unlikely to wait more than 90 days between purchases, you may consider a customer churned after that amount of time has passed. In this example, the closer to 90 days it has been since a customer’s previous interaction, the higher the likelihood that they will churn. Monitor the health of your customers and assign a risk factor based on how likely they are to churn. When the risk factor is high, take steps to retain their business, such as reaching out to them with personalised emails offering loyalty programs, special offers or value-added services. There are many causes of customer churn, but it all comes down to establishing, maintaining and developing a good relationship. When a customer churns almost immediately, the cost spent on converting them could be greater than the amount they spent on your business, so when it comes to finding your audience, it really is quality over quantity. Building loyalty and trust will always bring more long-term value to your business than simply converting as many customers as you can. Let us know how you keep your customers coming back for more by leaving a comment below! For more in-depth, up-to-date information and advice on how to identify, convert and retain your target audience, subscribe to the DalPay Blog and follow us on Facebook and Twitter.